This article is about the television show. For the soundtrack album, see Phineas and Ferb (soundtrack). For the video game, see Phineas and Ferb (video game). Phineas and Ferb is an American animated musical comedy television series. Originally broadcast as a one-episode preview on August 17, 2007 and again previewed on September 28, 2007, the series officially premiered on February 1, 2008 on Disney Channel, running until June 12, 2015. The program follows Phineas Flynn and his stepbrother Ferb Fletcher on summer vacation. Every day, the boys embark on some grand new project; these are usually unrealistic given the protagonists' ages (and are sometimes downright physically impossible), which annoys their controlling sister, Candace, who frequently tries to reveal their shenanigans to her and Phineas' mother, Linda Flynn-Fletcher, and less frequently to Ferb's father, Lawrence Fletcher. The series follows a standard plot system; running gags occur every episode, and the b-plot almost always features Phineas and Ferb's pet platypus Perry the Platypus working as a spy (named "Agent P") for OWCA (the Organization Without a Cool Acronym), to defeat the latest scheme of Dr. Heinz Doofenshmirtz, a mad scientist driven largely by a need to assert his evilness (although he is not especially evil and has a good heart in some situations.) The two plots intersect at the end to erase all traces of the boys' project just before Candace can show it to their mother. This usually leaves Candace very frustrated. Creators Dan Povenmire and Jeff "Swampy" Marsh had previously worked together on Fox's The Simpsons and Nickelodeon's Rocko's Modern Life. The creators also voice two of the main B-plot characters: Major Monogram and Dr. Doofenshmirtz. Phineas and Ferb was conceived after Povenmire sketched a triangular boy – the prototype for Phineas – in a restaurant. Povenmire and Marsh developed the series concept together and pitched it to networks for 16 years before securing a run on Disney Channel. Povenmire drew inspiration for the show from his boyhood in Mobile, Alabama. The show follows the adventures of stepbrothers Phineas Flynn (Vincent Martella) and Ferb Fletcher (Thomas Sangster), who live in the fictional city of Danville, in a (never specified) tri-state area, as they seek ways to occupy their time during their summer vacation. Often these adventures involve elaborate, life-sized and ostensibly dangerous construction projects. Phineas's older sister, Candace Flynn (Ashley Tisdale), has two obsessions: "busting" Phineas and Ferb's schemes and ideas, and winning the attention of a boy named Jeremy (Mitchel Musso). Meanwhile, the boys' pet platypus, Perry, acts as a secret agent for an all-animal government organization called the O.W.C.A. ("Organization Without a Cool Acronym"), fighting Dr. Heinz Doofenshmirtz. Some incident gives Phineas an idea for a project, and he announces, "Hey Ferb, I know what we're gonna do today!" Meanwhile, Perry slips away, using one of many hidden tunnels, to a secret underground base. Phineas (or occasionally another character) remarks, "Hey, where's Perry?" Major Monogram briefs Perry (whom he calls "Agent P") on his mission; this sometimes amounts to nothing more than "Doctor Doofenshmirtz is up to something; find out what it is, and put a stop to it!" Candace sees what the boys are doing, and resolves to tell her Mom to "bust them". Perry breaks into the skyscraper office of Doofenshmirtz Evil Inc. (complete with its own easy listening jingle, and variations depending on location and time). Doofenshmirtz traps Perry and explains his current evil plan. Perry escapes the trap and they battle. Phineas and Ferb complete their project. Mom gets home and Candace thinks that, at last, Mom will see what the boys have been up to and believe her, but just as Mom is about to step into the back yard, all evidence vanishes, usually as a side effect of Doofenshmirtz's device. Doofenshmirtz, foiled again, cries out, "Curse you, Perry the Platypus!" Doofenshmirtz's names for his contraptions all have the same suffix, "-inator", as in Shrinkinator, Giant Dog Biscuit-inator, "Eradicate Rodney's -Inator", etc. Eventually he starts calling them "inators" as a generic term. Doofenshmirtz has a daughter, Vanessa, who generally finds his work boring, but sometimes tries to prove to her mother that he is evil. Like Candace, she always fails. Ferb rarely speaks more than once in an episode. Garden gnomes are often seen or used as plot points. Isabella, who has a crush on Phineas, comes into the backyard and asks, "Whatcha doin'?" in a distinctive singsong tone. She doesn't like it when other characters (besides Phineas) say that line. For example, in "Suddenly Suzy", after both Suzy and Candace speak that line, Isabella grumbles "Uh, hello!?" and "Do I even need to be here? ", respectively. Aspects of the show's humor are aimed at adults, including its frequent pop-cultural references. Co-creator Dan Povenmire, who had previously worked on Family Guy, sought to create a less raunchy show that would make similar use of comic timing, metahumor, humorous blank stares, wordplay and breaking the fourth wall. Povenmire describes the show as a combination of Family Guy and SpongeBob SquarePants. Jeff "Swampy" Marsh, the other co-creator, said the show was not created just for kids; he simply did not exclude them as an audience. On May 7, 2015, Disney officially announced that the series had wrapped up after four seasons, and the final hour-long episode titled "Phineas and Ferb: Last Day of Summer" would premiere on June 12, 2015 on Disney XD, simulcast on Disney Channel. A 73-hour marathon of the show would begin on Disney XD on June 9, 2015. The series officially ended on June 12, 2015 on Disney Channel and Disney XD. It was also announced that a stand-alone hour-long special titled "O.W.C.A. Files" would be released the following autumn. The special officially premiered on Disney XD on November 9, 2015. A platypus was included in the series due to its interesting appearance. The series' main characters live in a blended family, a premise the creators considered underused in children's programming and which reflected Marsh's own upbringing. Marsh considers explaining the family background "not important to the kids' lives. They are a great blended family and that's all we need to know." The choice of a platypus as the boys' pet was similarly inspired by media underuse, as well as to exploit the animal's striking appearance. The platypus also gives them freedom to "make stuff up" since "no one knows very much about them." An additional reason for choosing a platypus allowed them to own that "mental real estate", so that if a person thinks "platypus", they'll associate it with "Agent P", just as an ogre is now commonly associated with Shrek. Marsh called the characters "cool, edgy and clever without ... being mean-spirited." Animation director Rob Hughes is said to have noted that "in all the other shows every character is either stupid or a jerk, but there are no stupid characters or jerks in this one." The series is known for some of its memorable songs, which appeared in almost every episode since the first-season "Flop Starz". Disney's executives particularly enjoyed the episode's song, "Gitchee, Gitchee Goo", and requested that a song appear in each subsequent episode. The music earned the series a total of four Emmy nominations: in 2008 for the main title theme and for the song "I Ain't Got Rhythm" from the episode "Dude, We're Getting the Band Back Together", and then in 2010 for the song "Come Home Perry" from the episode "Oh, There You Are, Perry" as well as one for its score. "Every episode since [Flop Starz] has a song in it. It's not always the characters singing onscreen – they don't break into song just to advance the plot. The music doesn't come out of nowhere, sometimes it's just a montage over action. We've done every genre known to man: ABBA, Broadway show tunes, 16th-century madrigals"
Dan Povenmire on the songs. Phineas and Ferb follows structural conventions Povenmire and Marsh developed while writing Rocko's Modern Life, whereby each episode features "a song or a musical number, plus a big action/chase scene". Both creators had musical backgrounds, as Povenmire performed rock and roll in his college years and Marsh's grandfather was the bandleader Les Brown. The creators' original pitch to Disney emphasized Perry's signature "secret agent theme" and the song "Gitchee Gitchee Goo" from "Flop Starz". Disney's managers enjoyed the songs and asked Povenmire and Marsh to write one for each episode. The songs span many genres, from 16th-century madrigals to Broadway show tunes. Each is written in an intensive session during episode production: a concept, score, and lyrics are developed quite quickly. Together, Marsh and Povenmire can "write a song about almost anything" and in only one hour at most. After they finish writing the song, Povenmire and Marsh sing it over the answering machine of series composer Danny Jacob on Friday nights. By the following Monday, the song is fully produced. The title sequence music, originally named 'Today Is Gonna Be a Great Day' and performed by the American group Bowling for Soup, was nominated for an Emmy award in 2008. The creators originally wrote a slower number, more like a "classic Disney song", but the network felt changes were needed to especially appeal to children and commissioned a rock version which made the final cut. A season 2 clip show broadcast in October 2009 focused on the music of Phineas and Ferb, featuring a viewer-voted top-10 of songs from the series; the end result was the "Phineas and Ferb's Musical Cliptastic Countdown." This clip show had a sequel, called the "Phineas and Ferb Musical Cliptastic Countdown Hosted by Kelly Osbourne". Kelly Osbourne hosted the special in live form, while Dr. Doofenshmirtz and Major Monogram were animated. It aired on June 28, 2013. Phineas and Ferb co-creators Dan Povenmire and Jeff "Swampy" Marsh in 2009. Dan Povenmire attributes the show's genesis to growing up in Mobile, Alabama, where his mother told him never to waste a day of summer. To occupy himself, Povenmire undertook projects such as hole-digging and home movie-making. Povenmire recalled, "My mom let me drape black material all the way across one end of our living room to use as a space field. I would hang little models of spaceships for these little movies I made with a Super 8 camera." He was an artistic prodigy and displayed his very detailed drawings at art shows. Meanwhile, Marsh grew up in a large, blended family. As with Povenmire, Marsh spent his summers exploring and taking part in several activities in order to have fun. Drawn on butcher paper, this first drawing of Phineas began a rapid growth of characters and the outline of the artistic style. While attending the University of Southern California, Povenmire started a daily comic strip called Life Is a Fish, and received money from the merchandise that was designed based on his series. Povenmire eventually dropped out and started drawing people on street corners to make a living, until he was finally called by Tommy Chong to work on a short bit of animation in the film Far Out Man. Povenmire began to take up animation professionally, working on shows such as Teenage Mutant Ninja Turtles. Marsh had become a vice president of sales and marketing for a computer company, until he "freaked out" and decided to quit. His friend helped him put together a portfolio and go into the animation business. Povenmire and Marsh eventually started working across from each other as layout artists on The Simpsons. The two bonded over mutual tastes in humor and music, becoming fast friends. They continued their working relationship as a writing team on the Nickelodeon series Rocko's Modern Life, where they conceived the idea for their own series. While eating dinner at a Wild Thyme restaurant in South Pasadena, California, Povenmire drew a quick sketch of a "triangle kid" on butcher paper. He tore it out and called Marsh that night to report, "Hey, I think we have our show." The triangle doodle sparked rapid development of characters and designs. Povenmire decided that his sketch "looked like a Phineas", and named Ferb after a friend who "owns more tools than anyone in the world." The creators based their character designs on angular shapes in homage to MGM/Warner Bros. animator/director Tex Avery, adding geometric shapes to the backgrounds for continuity. Disney Channel was the first network to give the series a chance, though initially declined when Dan Povenmire originally pitched it to them. Their early attempts to pitch the show failed and, though they remained committed to the concept, Povenmire and Marsh began to drift apart after their work on Rocko's. Marsh moved to London and worked on shows including Postman Pat and Bounty Hamster. Povenmire began working on the primetime Fox series Family Guy, as well as Nickelodeon series SpongeBob SquarePants, always carrying a Phineas and Ferb portfolio for convenient pitching to networks like Cartoon Network and Fox Kids. These networks passed on the show, believing the series' premise was too complex to succeed. Povenmire persisted and later pitched the series to Nickelodeon, where it was considered by high-level executives but rejected again as too complicated. Then, after 16 years of trying, Povenmire landed a pitch with Disney. The network did not immediately accept the show, but told Povenmire they would keep the packet. Povenmire assumed this meant an end to negotiations, aware that the phrase usually "means they throw it in the trash later." Disney then surprised him by accepting. Said Povenmire, "Disney was the first to say, 'Let's see if you can do it in 11 minutes.' We did it in the pilot and they said, 'Let's see if you can do it for 26 episodes.'" Povenmire was initially worried that his work on Family Guy (an adult show known for its lowbrow humor) would concern Disney, which markets primarily towards families. However, the Disney Channel's Senior Vice President of Original Series, Adam Bonnett, was a Family Guy fan who appreciated Povenmire's connection to the show and received his pitch well. 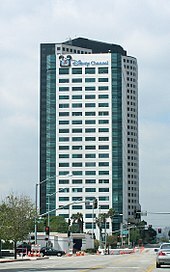 In 2006, after the Disney Channel accepted the show, Povenmire and Marsh turned their attention to the company's overseas executives. Instead of a normal script, the two drew out storyboards and played them in a reel. Povenmire voiced over the reel with his dialogue and added sound effects. This novel approach secured the executives' support. The show uses four major writers to devise story ideas according to "strict guidelines", such as that the boys' schemes never appear to be "magical." Stories are reviewed at weekly sessions on a Monday, then simultaneously scripted and storyboarded. A very rough design is built before the storyboard, featuring little more than suggested scenes and dialogue, is drafted; the writers then gather for a "play-by-play" walkthrough of the storyboard in front of the whole crew, whose reactions to the jokes are assessed before rewrites are made. The writers as well include running gags in every episode, which are generally lines spoken by characters. Almost every episode is set into two eleven-minute segments. The stages of development for a scene during the opening theme, from the original draft (top) to the final design (bottom). The top appears briefly in the Season 1 theme. Rough Draft Studios in South Korea, Wang Film Productions in Taiwan, and Synergy Animation and Hong Ying Animation in Shanghai animate the series in 2D Animation using the software packages Toon Boom. Povenmire undertakes the bulk of production direction, along with Zac Moncrief and Robert Hughes. The series adopts artistic features from animator Tex Avery, such as geometric shapes integrated into characters, objects, and backgrounds. Dan Povenmire said of this inclusion, "There's a little bit of Tex Avery in there-he had that very graphic style [in his later cartoons]." Triangles are featured as an easter egg in the background of every episode, sometimes in trees or buildings. Bright colors are also a prominent element of the animation. Marsh elaborates, "The idea at the end of the day was candy. One of the things that I think works so well is that the characters are so bright and candy-colored and our backgrounds are a much more realistic depiction of the world: the soft green of the grass, the natural woods for the fence. In order for all the stuff that they do to work, their world needs to be grounded in reality." The designers sought to keep their characters visually simple, so that kids "would easily be able to draw [them] themselves." Characters were also crafted to be recognizable from a distance, a technique the creators say is based on Matt Groening's goal of making characters recognizable by silhouette. Phineas and Ferb are voiced by Vincent Martella and Thomas Sangster, respectively. Sangster was one of many British actors cast; Marsh lived in the United Kingdom for seven years, and developed a fondness for the British. The rest of the cast includes Ashley Tisdale as their sister, Candace; Bobby Gaylor as Buford van Stomm, who has a tendency to bully but is kept distracted by being included in the adventures; Maulik Pancholy as Baljeet Tjinder, a very intelligent boy who would be Buford's main victim but who is almost friends with him due to the adventures; Dee Bradley Baker as Perry the Platypus and just plain Perry, as Phineas calls him; Caroline Rhea as Linda Flynn-Fletcher, who is Phineas and Candace's mother, and stepmother to Ferb; Jack McBrayer as Irving who admires Phineas and Ferb, and creator of the Phineas and Ferb Fansite; Kelly Hu as Candace's best friend, Stacy; creators Dan Povenmire as Dr. Doofenshmirtz and Jeff "Swampy" Marsh as Major Monogram, respectively; Olivia Olson as Dr. Doofenshmirtz's not-really-evil daughter Vanessa; Tyler Mann as Carl, Major Monogram's goofy super genius intern; Alyson Stoner as Isabella Garcia-Shapiro, a sweet girl who leads the Fireside Girls and has a crush on Phineas (it is revealed that Isabella's family is "Mexican Jewish" and lives across the street from the Flynn-Fletchers); Mitchel Musso as Jeremy, Candace's crush then later her boyfriend; Madison Pettis stars as Adyson Sweetwater. The show's casting organization is responsible for selecting most of the voice actors and actresses, choosing actors such as Vincent Martella and Mitchel Musso for major roles based on perceived popularity with target demographics. Povenmire and Marsh select guest stars, casting people that they "really want to work with". They also solicit guest roles from actors they feel would lend an interesting presence to the show. Guest stars have included pop culture figures like Damian Lewis, boxer Evander Holyfield, film stars Cloris Leachman and Ben Stiller, and pop singer Kelly Clarkson. Povenmire and Marsh have also solicited Tim Curry and Barry Bostwick, stars of The Rocky Horror Picture Show, to make guest appearances, while creator Richard O'Brien voices Lawrence, Ferb's father and Candace and Phineas's stepfather. O'Brien's participation eventually became regular, as he was cast to play Lawrence Fletcher, the children's father, who appears in about half of the episodes in the show. Top Gear stars Jeremy Clarkson, Richard Hammond, and James May all guest starred in a race-car themed episode as commentators. Other guest stars include Tina Fey, Seth MacFarlane, David Mitchell, Jaret Reddick, Clay Aiken, Chaka Khan, and Kevin Smith. The show has received generally positive reviews. The New York Times commented favorably, describing the show as "Family Guy with an espionage subplot and a big dose of magical realism". It considered the pop-culture references ubiquitous "but [placed] with such skill that it seems smart, not cheap." Whitney Matheson wrote in her USA Today blog "Pop Candy" that the series was an achievement in children's programming. Matheson applauded the writing and called it "an animated version of Parker Lewis Can't Lose." Emily Ashby of Common Sense Media praised the show's humor and plot, giving it four out of five stars. The Seattle Times wrote that the story of the show was "valiant" and that the main characters of Phineas and Ferb were "young heroes". Variety noted the show's appeal to all ages with its "sense of wit and irreverence." Similar reviews have emphasized the series' popularity with adults; Elastic Pops Rebecca Wright wrote, in a review for the volume one DVD, "As an adult, I really enjoyed watching this Phineas and Ferb DVD, and I think it is one that the whole family can enjoy." Wright also called the series' "irreverent style" reminiscent of The Adventures of Rocky and Bullwinkle. Wired's Matt Blum has stated in reviews on the series that he "can stand to watch just about anything with [his] kids, but [he] actually look[s] forward to watching Phineas and Ferb with them." Notable adult celebrities who have openly considered themselves fans of the series include Bob Eubanks, Anthony LaPaglia, Ben Stiller, Chaka Khan, Jeff Sullivan and Jake Gyllenhaal. Among the negative reviews is one that charges the series with a lack of originality. Maxie Zeus of Toon Zone argued that the show is "derivative, but obviously so, and shorn of even the best features of what has been stolen." Zeus took issue with the writing, feeling that certain jokes and conventions were "ripped-off" from other shows. Kevin McDonough of Sun Coast Today criticized the show for its plot complexity, constant action, and "characters [that] can do just about anything." McDonough stated that "it's never clear whether P&F are intended to entertain children or are merely a reflection of grown-up animators engaged in a juvenile lark." Marylin Moss of The Hollywood Reporter described Phineas and Ferb as "Pretty mindless but kids of all ages might find a humorous moment in it." Moss called the plot lines redundant but did praise the music styles and guest stars. Alan Sepinwall and Matt Zoller Seitz gave a positive assessment for Phineas and Ferb in their 2016 book titled TV (The Book), stating that "In television, formula often seems to come from a lack of imagination. ... Phineas and Ferb though, managed at the same time to be wildly imaginative and slavishly formulaic, using its repetitive structure not as a crutch, but as a sturdy framework on which it could hang all kinds of fantastic new ideas." They further added that "the characters' awareness of that formula, and any deviations from it, quickly became one of the show's most fertile sources of humor." The first episode, "Rollercoaster", garnered a total of 10.8 million viewers when aired as a preview on August 17, 2007, holding onto more than half the record-setting audience of its lead-in, High School Musical 2. When Phineas and Ferb officially debuted in February the next year, it proved cable's number one watched animated series premiere by "tweens". Throughout the first quarter that followed, it peaked as the top-rated animated series for ages 6–10 and 9–14, also becoming number three animated series for all of cable television for viewers age 6–10. By the time the commissioning of the second season was announced in May 2008, the series had become a top-rated program in the 6–11 and 9–14 age groups. The Disney Channel's airing of "Phineas and Ferb Get Busted" was watched by 3.7 million viewers. The episodes "Perry Lays an Egg" and "Gaming the System" on Disney Channel achieved the most views by ages 6–11 and 9–14 of any channel in that night's time slot. This achievement propelled the series to the number one animated telecast that week for the target demographics. On June 7, 2009, Disney announced that the show had become the number one primetime animated television show for the demographics 6-10 and 9-14. The premiere of "Phineas and Ferb's Christmas Vacation" garnered 2.62 million viewers during its debut on Disney XD, the most watched telecast in the channel's history (including Toon Disney) and the number three program of the night in all demographics. It received 5.2 million viewers for its debut on Disney Channel. It was the highest rated episode of the series to date and 5th highest for the week. The premiere of "Phineas and Ferb: Summer Belongs To You!" garnered 3.862 million viewers, was watched by 22% of kids 2–11, 13% of teens, 5% of households, and 3% of adults 18–49, also being the #1 program on that night and it was 25th for the week in viewership. On Disney XD, the episode ranked in the channel's top 3 telecasts of the year in viewers with 1.32 million, and Boys 6–11 with 365,000, with a 2.9 rating. The hour telecast on August 2, 2010 is currently the Emmy-winning animated series' No. 2 telecast of all time on Disney XD in Total Viewers, in kids 6–14 with 677,000 and a 1.9 rating, Boys 6–14 with 435,000 and a 2.3 rating, and kids 6–11 with 542,000 and a 2.2 rating, Boys 6–11 and Boys 9–14 235,000 with a 1.9 rating, behind only December 2009's "Phineas and Ferb's Christmas Vacation". Disney has licensed a number of products from the show, including plush toys of characters Perry, Ferb, Phineas, and Candace. Disney released several T-shirts for the show and launched a "Make your own T-shirt" program on its Disney website. Authors have novelized several episodes. Two season one DVDs, entitled The Fast and the Phineas and The Daze of Summer, have been released; the discs include episodes never broadcast in America. A third DVD was released on October 5, 2010, called A Very Perry Christmas. Some reviewers were displeased that the discs covered selected episodes rather than providing box sets of whole series, but noted that Disney does not generally release full-season DVD sets. In 2009, Disney licensed a Nintendo DS game, titled like the show, Phineas and Ferb. The game's story follows the title characters as they try to build a roller coaster to stop boredom over the summer (in reference to the show's pilot episode). The player controls Phineas, Ferb and occasionally Agent P (Perry the Platypus). Phineas scavenges for spare parts for the rollercoaster while Ferb fixes various objects around town, gaining access to new areas as a result. Ferb can also construct new parts of the rollercoaster and its vehicle-themed carts. Each activity features a short mini-game. The game was well received and garners a 76.67% on GameRankings. A sequel entitled Phineas and Ferb: Ride Again was released on September 14, 2010. Dan Povenmire and Jeff "Swampy" Marsh have also announced that there is a Phineas and Ferb Wii game in development. It was later confirmed that this game would be a video game adaptation of the TV movie, also available for Nintendo DS and PlayStation 3. In 2012, Disney opened an interactive game based on the series in Epcot, titled Agent P's World Showcase Adventure, which centered around Perry and Dr. Doofenshmirtz, based on the previous attraction Kim Possible World Showcase Adventure. Disney has been focusing on the development of their "Infinity" system. Also in 2012, Disney Mobile launched a mobile game titled Where's My Perry? for iOS and Android. It was based on Disney's popular Where's My Water? game, using similar physics. In this game, Agent P is trying to get into O.W.C.A. headquarters but the transport tubes are out, so he needs water for the backup underground hydrogenerators. If you struggle or get stuck, Major Monogram and Carl will offer encouragement while Doofenshmirtz will taunt him. Phineas and Ferb never appear in the game except in the opening splash screen. The game was expanded to include levels featuring Doofenshmirtz and other animal agents. The game has a 4.0 rating on iTunes, but has not been updated in more than a year. In 2013, Disney commissioned Majesco Entertainment to create the newest Phineas and Ferb video game, which released in August 2013, entitled Phineas and Ferb: Quest for Cool Stuff, which is available on Xbox 360, Wii U, Wii, Nintendo 3DS and Nintendo DS. The United Kingdom Disney Channel has aired a series entitled Oscar and Michael's Phineas and Ferb Fan Club Show in homage to the animated series. The show features two boys who attempt to be like Phineas and Ferb by taking part in adventures to alleviate boredom. The series aims at educating kids and promoting activity and creativity. It entered its second season on April 10, 2009. The television series Psych has made references to Phineas and Ferb in its sixth season. In the episode "Shawn Rescues Darth Vader," main character Shawn Spencer (portrayed by James Roday) states that he learned his British accent from the granddad on Phineas and Ferb (he tells this to guest star Malcolm McDowell, who also happens to voice the granddad). And in "The Amazing Psych Man & Tap-Man, Issue #2," Shawn once again name-drops the series, stating: "I'm missing a Phineas and Ferb marathon. Perry the Platypus. He's a real platypus." Outstanding Original Music and Lyrics "I Ain't Got Rhythm"
Outstanding Original Song – Children's and Animation "Come Home Perry"
1.^A Academy of Television Arts & Sciences announced that they would not present the award to either nominee in the category. 2.^B Shared with Back at the Barnyard. On March 3, 2010, a Disney press release announced a made-for-television film, based on Phineas and Ferb entitled Phineas and Ferb the Movie: Across the 2nd Dimension. It aired on the Disney Channel on August 5, 2011. The film concerned Phineas and Ferb accidentally helping Dr. Doofenshmirtz with an invention of his, which takes them to a parallel dimension. There, Perry reveals his double life as a secret agent to them, and, to save their friends from an alternative Dr. Doofenshmirtz, who is far more devious and threatening than his prime counterpart, they team up with their alternate dimension selves to stop him. On January 11, 2011, Disney Channels Worldwide chief Gary Marsh announced that a feature film based on Phineas and Ferb was in development by Tron: Legacy producer Sean Bailey. As of September 6, 2011, Dan and Swampy had finished writing the script. In October 2011, the film, tentatively titled simply Phineas and Ferb, was given the release date of July 26, 2013 by Walt Disney Pictures, a slot previously occupied by Thor: The Dark World. On October 27, 2011, it was announced that Michael Arndt, who had written Little Miss Sunshine and Toy Story 3, had been hired to write the draft for the film. The project will now be produced by Mandeville Films. In October 2012, Disney moved the release date to 2014, and in August 2013, the film was removed from its schedule. This led to speculation that it was cancelled, but Swampy Marsh confirmed via Twitter that the film was just on hold. On July 12, 2015, it was confirmed that a form of the script of the film was completed. When asked again on the film's state in February 2018, it was revealed that the film might return into development depending on the success of the Milo Murphy's Law crossover special. On April 11, 2019, it was announced that a film titled The Phineas and Ferb Movie: Candace Against the Universe, would be released on Disney+ within a year of its launch. Most of the series cast will be reprising their roles, except Thomas Sangster as Ferb, who will be replaced by David Errigo Jr., who previously voiced Ferb on Milo Murphy's Law. In 2012, it was announced that a crossover between Phineas and Ferb and Marvel Entertainment, would air in the summer of 2013, titled Phineas and Ferb: Mission Marvel. It features Marvel Comics superheroes Iron Man, Spider-Man, the Hulk and Thor and the villains the Red Skull, Whiplash, Venom and M.O.D.O.K.. It is the first major animated crossover between Marvel and Disney since the acquisition of Marvel Entertainment by Disney in 2009. In July 2013, the producers announced a Phineas and Ferb/Star Wars crossover which was used as a sidebar to the events of Episode IV: A New Hope. The special aired on July 26, 2014. Co-creator Dan Povenmire has said that he would like to do a crossover with his and Jeff "Swampy" Marsh's follow-up show, Milo Murphy's Law, which takes place in the same universe as Phineas and Ferb. On July 21, 2017, it was announced that the crossover was planned to be broadcast in 2018. However, on August 9, 2018, it was announced the episode premiered in January 2019. The entire cast is confirmed to reprise their roles with the exception of Ferb who will instead be voiced by David Errigo, Jr. Before the crossover aired, a character from Phineas and Ferb, Dr. Heinz Doofenshmirtz, cameoed at the end of the episode "Fungus Among Us"; following the crossover, the characters Doofenshmirtz, Perry the Platypus, Major Monogram and Carl joined the cast of Milo Murphy's Law in a recurring capacity. Phineas and Ferb: The Best LIVE Tour Ever was a touring two-act stage of the TV show. A projection system played video in the same style as the TV show on the rear of the stage; the characters were first introduced there in their cartoon forms, but then used a backyard slide that continued into a physical slide out of which the live cast members emerged into the real world. The performers wore prosthetics to make their characters resemble their cartoon counterparts—mostly head pieces, but a full body suit in the cases of Buford and Perry. The 2011-2012 season of the tour began on August 21, 2011 in Lakeland, Florida and ended on April 22, 2012 in East Rutherford, New Jersey. The 2012-2013 season began on August 23, 2012 in Wheeling, West Virginia and ran until February 18, 2013 in Chattanooga, Tennessee. Disney produced a live-action talk show where the two characters (as cartoons) interview celebrities, similarly to Space Ghost Coast to Coast, which began airing in December 2010 as a two-minute talk-show format, featuring real-life celebrities such as Tony Hawk, Randy Jackson, Neil Patrick Harris, Seth Rogen, Taylor Swift, Andy Samberg, Tom Bergeron, Emma Roberts, Jack Black, Regis Philbin, Howie Mandel, David Beckham and Guy Fieri. The show ended on November 25, 2011. ^ a b c d e f g h i j Strike, Joe. "From Swampy & Dan Emerges Phineas and Ferb", PFage 1". Animation World Magazine. Archived from the original on 2010-07-22. Retrieved 2009-08-26. ^ a b c d Dan Povenmire, Jeff "Swampy" Marsh (2008). Original Pitch By Dan Povenmire (DVD). Disney DVD. ^ a b c d e f g h i j k Strike, Joe. (2008-02-01). "From Swampy & Dan Emerges Phineas and Ferb", Page 2". Animation World Magazine. Retrieved 2009-08-26. ^ Writers: Kim Roberson, Marc Ceccarelli (2008-07-12). "Traffic Cam Caper". Phineas and Ferb. Season 1. Disney Channel. ^ Writers: Kim Roberson, Piero Piluso, Ken Osborne (2008-12-05). "Out to Launch". Phineas and Ferb. Season 1. Disney Channel. ^ a b c Blum, Matt (2008-07-09). "Phineas and Ferb: Kid Inventors and a Secret Agent Platypus". Wired. ^ a b c d e f g Galas, Marjorie. "Phineas and Ferb: Music, Mischief, And The Endless Summer Vacation". 411 News. Archived from the original on June 7, 2009. Retrieved 2009-07-03. ^ a b Stewart, Susan (2008-02-01). "Bored Stepbrothers, Intrepid Platypus". New York Times. Retrieved 2009-07-03. ^ a b c d e Strike, Joe (2008-02-01). "From Swampy & Dan Emerges Phineas and Ferb", Page 3". Animation World Magazine. Archived from the original on 2010-09-01. Retrieved 2009-08-26. ^ Santiago, Rosario (2008-02-08). "'Family Guy' Helped Inspire 'Phineas and Ferb'". BuddyTV. Archived from the original on 2012-08-19. Retrieved 2009-08-26. ^ Matt Webb Mitovich. "Disney's Phineas and Ferb to End in June, With 73-Hour Marathon - TVLine". TVLine. ^ a b c d e "Disney gives 'Ferb' pickup, major push - Q&A: Dan Povenmire". The Hollywood Reporter. 2009-06-07. Retrieved 2017-03-05. ^ a b c Robinson, Sherry (2009-04-18). "Quick wit, funny characters drive Phineas and Ferb". St. Petersburg Times. St. Petersburg, Florida. Archived from the original on 2011-06-07. Retrieved 2009-08-16. ^ David Kahn (2014-06-05). "Phineas & Ferb on Mental Real Estate". Leaders Say What. Retrieved 2016-12-20. ^ a b "Emmy Awards website". Results for Disney nominations in 2008. Retrieved 2010-03-04. ^ a b c d Perez, Lauren (2008-05-01). "USC dropout makes it big in animation". Daily Trojan. Archived from the original on 2008-08-22. Retrieved 2017-03-05. ^ A Day With 'Phineas and Ferb'. MSN TV. Retrieved 2009-07-02. ^ Haugsted, Linda (2007-11-18). "'Ferb' Goes Global at Premiere". Multichannel News. Archived from the original on June 15, 2011. Retrieved 2009-09-26. ^ "Disney Preps 'Phineas And Ferb' Fall Event". Multichannel News. 2009-07-26. Archived from the original on January 14, 2010. Retrieved 2009-09-22. ^ "KerryClemens.com". Archived from the original on 18 October 2014. Retrieved 12 October 2014. ^ Brantley, Mark. "Disney animator sees summers in Mobile as inspiration". Alabama press. Retrieved 2009-07-03. ^ a b Vincent @ Comic Con 2008 (1:56). MSN TV News. 2008-08-09. Retrieved 2009-08-23. ^ "'Rocko' writers return to TV with 'Phineas and Ferb'". Reading Eagle. 2009-04-18. Retrieved 2009-08-26. ^ Holman, Curt (2009-05-14). ""Phineas and Ferb" trails after the boys of summer". Creating Loafing. Archived from the original on September 22, 2009. Retrieved 2009-08-26. ^ Zahed, Ramin (2009-07-16). "Phineas and Ferb Creators Talk About Emmy Nom!". Animation Magazine. Retrieved 2009-08-18. ^ Walker, Lex (2009-02-14). "Phineas and Ferb: The Daze of Summer". Just Press Play. Archived from the original on 2012-09-07. Retrieved 2009-08-26. ^ "Phineas and Ferb: Cast & Details". TV Guide. Retrieved 2009-07-12. ^ a b c Ball, Ryan (2009-04-10). "Disney Renews Phineas and Ferb". Animation Magazine. Retrieved 2009-08-20. ^ a b Kuttner, Julia (2008-02-04). "New Cartoon Role For Love Actually Star Thomas Sangster". Daily Record. Archived from the original on November 28, 2009. Retrieved 2009-08-26. ^ a b c Yoo, Jean. "Phineas and Ferb—Show description". Disney Channel Medianet. Retrieved 2009-07-09. ^ "Top Gear Thursday: Jeremy, James and Richard – and Phineas and Ferb! | BBC America". BBC America. Retrieved 2018-06-29. ^ Vincent @ Comic Con 2008 (2:00). MSN TV News. 2008-08-09. Retrieved 2009-08-23. ^ Matheson, Whitney (2009-06-06). "TV Taste Test: I sample 'Phineas,' 'That Metal Show' and more". USA Today. Retrieved 2009-08-26. ^ Ashby, Emily. "Phineas and Ferb television review". Common Sense Media. Retrieved 2009-08-26. ^ "Disney summer, oil, Globetrotters, TV Lookout". Seattle, Washington: The Seattle Times. 2008-01-27. ^ Lowry, Brian (2008-01-31). "Phineas and Ferb Review". Variety. Retrieved 2009-08-20. ^ Wiser, Paige (2009-12-24). "With a song in their 'Ferb'". Chicago Sun Times. Archived from the original on November 29, 2010. Retrieved 2009-12-25. ^ Wiser, Paige (2009-12-21). "An interview with the creators of 'Phineas and Ferb'". Chicago Sun Times. Archived from the original on 2009-12-24. Retrieved 2009-12-25. ^ Sullivan, Jeff (2011-04-02). "Lookout Landing Game Thread". Lookout Landing. Retrieved 2011-04-02. ^ Zeus, Maxie (2008-02-01). 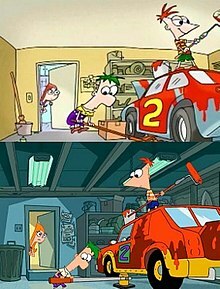 ""Phineas and Ferb": Spawn of Frankenstein". Toon Zone. Archived from the original on 2009-08-22. Retrieved 2009-08-26. ^ McDonough, Kevin (2008-02-01). "'Phineas and Ferb' is frantic from start to finish". Sun Coast Today. Retrieved 2009-08-20. ^ Sepinwall, Alan; Seitz, Matt Zoller (6 September 2016). TV (The Book): Two Experts Pick the Greatest American Shows of All Time. Grand Central Publishing. ISBN 978-1455588190. ^ Littleton, Cynthia. ""High School Musical 2" : OMG! It's a cable ratings record". Variety. Archived from the original on August 21, 2009. Retrieved 2009-08-26. ^ Bynum, Aaron H. (2009-05-09). "Phineas, Ferb and Springtime Fun". Animation Insider. Archived from the original on August 21, 2009. Retrieved 2009-08-26. ^ Seidman, Robert (2009-03-16). "Disney Channel's "Phineas & Ferb" is Friday's #1 TV telecast in Key Kids". TV By the Numbers. Archived from the original on 2009-08-21. Retrieved 2009-08-26. ^ Seidman, Robert (2009-05-27). "Disney Channel is TV's No. 1 Network in Total Day Among Tweens 9-14 for the Sixth Time in 7 Weeks". TV By the Numbers. Archived from the original on 2009-08-21. Retrieved 2009-08-26. ^ Seidman, Robert (2009-12-08). "The Debut of "Phineas and Ferb Christmas Vacation" is Disney XD's #1 Telecast Ever Across All Demos". TV By the Numbers. Archived from the original on 2009-12-11. Retrieved 2009-12-19. ^ Jones, Anthony (2009-12-08). "Disney XD Earns Most-Watched Day And Telecast With "Phineas And Ferb Christmas Vacation"". All Headline News. Archived from the original on 2011-09-28. Retrieved 2009-12-19. ^ Umstead, R. Thomas (2009-12-15). "Disney Rings In Holiday Ratings For `Phineas And Ferb' Special". Multichannel News. Archived from the original on September 22, 2012. Retrieved 2009-12-19. ^ Retrieved 2010-08-11 Friday Cable: Phineas and Ferb + Eureka, Haven, The Pillars of the Earth & More Archived 2010-08-27 at the Wayback Machine Posted on 09 August 2010 by Robert Seidman. ^ "Disney XD's Premiere of Phineas and Ferb Summer Belongs to You among the top 3 telecasts of the year in total viewers and boys". August 4, 2010. Archived from the original on 2012-07-16. Retrieved 2010-09-13. ^ "Amazon.com: Phineas and Ferb toys". Retrieved 2009-07-09. ^ "Phineas and Ferb shirts". Stylinonline.com. Archived from the original on April 3, 2009. Retrieved 2009-07-03. ^ "Amazon.com: Phineas and Ferb". Amazon.com. Retrieved 2009-07-03. ^ a b Cornelius, David (2008-08-21). "Phineas and Ferb: The Fast and the Phineas: DVD Talk Review of the DVD Video". DVD Talk. Retrieved 2009-07-03. ^ "Phineas and Ferb: The Daze of Summer DVD Review". Ultimate Disney. Retrieved 2009-06-24. ^ "Phineas and Ferb :: DS Game Review". Kidzworld. Retrieved 2009-05-02. ^ "Phineas and Ferb—Nintendo DS". GameSpy. Retrieved 2009-06-23. ^ "Phineas and Ferb Video Game". Game Trailers. Retrieved 2009-06-23. ^ "Phineas and Ferb for the DS". Game Rankings. Retrieved 2009-09-21. ^ Blum, Matt (2009-09-18). "Phineas and Ferb: A Sci-Fi Episode, a Soundtrack Album, and an Interview!". Wired. Archived from the original on September 23, 2009. Retrieved 2009-09-20. ^ "High Impact Games – News". High Impact Games. Retrieved 2011-11-25. ^ "Disney World: Agent P at Disney World's Epcot". OrlandoSentinel.com. 2012-07-05. Retrieved 2012-11-28. ^ "Where's My Perry? App". DisneyNews (dot us). Retrieved 17 December 2018. ^ Culafi, Alex (2013-06-16). "Phineas and Ferb: Quest for Cool Stuff". Nintendo World Report. Retrieved 2013-07-21. ^ Ibarra, Sabina (2013-06-21). "E3 2013 – PHINEAS & FERB CREATORS ON THE QUEST FOR COOL STUFF AND MISSION MARVEL". Geek Exchange. Archived from the original on 2013-07-26. Retrieved 2013-07-25. ^ a b "Seaford boy stars in Disney show". Mid Sussex Times. 2008-04-09. Retrieved 2009-08-26. ^ "Schoolboy back for Disney fun". Eastbourne Today. 2009-04-08. Retrieved 2009-08-26. ^ "Children's Awards Winners". British Academy of Film and Television Arts. 2008-11-30. Archived from the original on 2012-08-04. Retrieved 2009-11-11. ^ "2008 Emmy Nominations: Additional Nominee List". BuddyTV. 2008-07-17. Retrieved 2009-08-26. ^ "36th Annual Annie Award Nominees and Winners (2008)". Archived from the original on February 17, 2009. Retrieved 2009-07-09. ^ "The BAFTA Kids' Vote". British Academy of Film and Television Arts. 2009. Retrieved 2009-11-11. ^ "Phineas And Ferb—Cartoon—Kids' Choice Awards 2009". Nick.com. Archived from the original on March 10, 2009. Retrieved 2009-07-09. ^ "2009 Emmy Awards nominations". Archived from the original on July 18, 2009. Retrieved 2009-07-16. ^ a b Zahed, Ramin (2009-04-06). "Cosmic Quantum Ray, Phineas & Ferb Big Winners at Cartoons on the Bay". Animation Magazine. Retrieved 2009-08-26. ^ Bynum, Aaron H. "38th Annual Annie Award Nominations". Animation Insider. p. 4. Archived from the original on March 21, 2012. Retrieved 2010-12-09. ^ a b "The National Academy of Television Arts & Sciences Announces Winners of the 37th Annual Daytime Entertainment Creative Arts Emmy Awards" (PDF). National Academy of Television Arts and Sciences. 2010-06-25. p. 20. Archived from the original (PDF) on 2010-09-22. Retrieved 2010-06-26. ^ a b c "Full list of 2010 Daytime Emmy Award nominations" (PDF). National Academy of Television Arts and Sciences. Archived from the original (PDF) on 2010-06-18. Retrieved 2010-05-16. ^ a b "Dulce María y "Grachi", ganadores del Kids' Choice Awards". Milenio.com. Archived from the original on 2012-09-13. Retrieved 2012-02-23. ^ a b "2011 Outstanding Individual Achievement in Animation Nominees/Winners". Retrieved 1 September 2016. ^ a b "Cynopsis Kids marketing awards for best kids TV shows and marketing and PR programs". Cynopsis.com. Archived from the original on 2012-11-11. Retrieved 2012-11-28. ^ "2012 Outstanding Individual Achievement in Animation". Retrieved 1 September 2016. ^ "2012 Outstanding Voice-Over Performance Nominees/Winners". Retrieved 1 September 2016. ^ TVLine, Team (May 22, 2013). "Big Bang, Horror Story, Parks and Rec, Good Wife, The Americans Lead Critics Choice Nominations". TVLine. TVLine Media, LLC. Retrieved May 22, 2013. ^ TVLine, Team (May 22, 2013). "Nickelodeon Kids Choice Awards Nominees". TVLine. TVLine Media, LLC. Archived from the original on May 18, 2013. Retrieved May 22, 2013. ^ "Children's in 2014". British Academy of Film and Television Arts. November 23, 2014. Retrieved November 23, 2014. ^ "2014 Primetime Emmy Award Nominations" (PDF). Emmys.com. July 10, 2014. Retrieved July 14, 2014. ^ "68th Emmy Awards Nominees and Winners- Outstanding Animated Program". Television Academy. July 15, 2016. ^ Fujimori, Sachi. "For Montvale Boy, It Was All Worth the Tux". California Chronicle. Archived from the original on 2009-10-29. Retrieved 2009-10-17. ^ Seidman, Robert (2010-03-03). "Disney Channel & Disney XD Present Programming Plans for 2010-11". TVBytheNumbers.com. Archived from the original on 2010-03-05. Retrieved 2010-03-03. ^ "Disney Planning Phineas and Ferb Feature Film". ^ Huff, Richard (2011-07-26). "'Phineas and Ferb' reinvent the essence of Disney Channel charm in kid-friendly TV movie". New York: Nydailynews.com. Retrieved 2011-09-03. ^ Masters, Kim (2011-10-13). "Official: Disney's 'Lone Ranger' Sets May 31, 2013 Release Date". The Hollywood Reporter. ^ SZeitchik, Steven (October 27, 2011). "'Phineas and Ferb' gets the 'Toy Story' treatment". Los Angeles Times. Retrieved August 17, 2013. ^ The Deadline Team (2012-10-15). "Disney's Marvel Movie Moves: Iron Man 3, Thor 2 Going 3D, Ant-Man Dated For 2015". Deadline. Retrieved 2012-10-18. ^ "Phineas And Ferb Off Disney's Release Schedule". Deadline. August 16, 2013. Retrieved August 17, 2013. ^ "swampy marsh on Twitter". Twitter. ^ "Jim Hill Media". Twitter. ^ "Jim Hill Media". Twitter. Retrieved February 10, 2019. ^ Porter, Rick (April 11, 2019). "Marvel's 'What If,' 'Frozen 2' Docuseries Set for Disney+". The Hollywood Reporter. Retrieved April 11, 2019. ^ Stevens, Colin (April 11, 2019). "Disney+ Confirms The Mandalorian Available at Launch, Falcon and Winter Soldier in First Year". IGN. Retrieved April 11, 2019. ^ "Disney's 'Phineas And Ferb' And Marvel's Favorite Super Heroes Team Up For Animated Movie". Allyourtv.com. 2012-07-14. Archived from the original on 2012-11-02. Retrieved 2012-11-28. ^ Blum, Matt. "First Animated Disney – Marvel Crossover Announced – And It's Phineas and Ferb! | GeekDad". Wired.com. Archived from the original on November 22, 2012. Retrieved 2012-11-28. ^ "Comic-Con: 'Phineas and Ferb' Heads to 'Star Wars' Universe in Special Episode". The Hollywood Reporter. 19 July 2013. Retrieved 12 October 2014. ^ "'Phineas and Ferb's' 'Star Wars' Special Lands Premiere Date". The Hollywood Reporter. June 12, 2014. Retrieved June 12, 2014. ^ "Phineas and Ferb Finale, 'Last Day of Summer', May Not Be as Final as We Think". The Huffington Post. 12 June 2015. ^ Nordyke, Kimberly (July 21, 2017). "Comic-Con: Disney XD Sets 'Milo Murphy's Law' and 'Phineas and Ferb' Crossover (Exclusive)". The Hollywood Reporter. Retrieved July 21, 2017. ^ Disney XD (August 9, 2018). "Confirmation on Facebook". Facebook. Retrieved August 9, 2018. ^ "'Phineas and Ferb: The Best Live Tour Ever!' coming to Columbus". Retrieved 2012-07-15. ^ "Welcome to Disney's Phineas and Ferb LIVE!". Disney.go.com. Archived from the original on February 19, 2012. Retrieved 2012-02-23. ^ Schneider, Michael (2010-11-04). "Disney XD orders 'Tron: Legacy' toon". Variety.